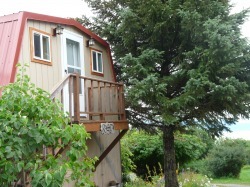 East End Haven B&B offers unique accommodations on private property just minutes from downtown Homer, Alaska. 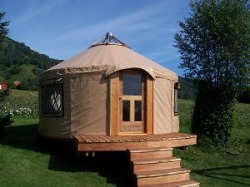 Overnight rentals include a choice of a beautiful, custom-made Alaskan yurt or a new, charming 2nd story guesthouse. Both units offer privacy and tranquility on five acres of landscaped lawn and gardens. Easily accessible by car, these well furnished lodgings offer a restful getaway and continental breakfast. This is the perfect place to base your visit to Homer, a lovely coastal town affectionately known as "our cosmic hamlet by the sea". Come be surrounded by beautiful Kachemak Bay and the snowy glaciers of the Kenai Mountains. Rentals are available mid May through early September. To check availability, please go to www.airbnb.com Direct links provided below. Enjoy a serene, peaceful night's sleep in this unique round structure that Mongolians have enjoyed for over 2,500 years. Comfortably sleeps two people on a queen sized bed with down comforter, linen, furniture, electricity. Continental breakfast is provided as well as drinking water. Bathroom amenities consist of a new outhouse located near by. An outdoor hanging glider and hammock offer relaxation in this quiet, park-like setting. This well furnished, charming guesthouse provides sleeping for two. Extremely clean, cozy and comfortable with electricity, heat and running water. Furnished with a new queen size bed with down comforter, linen, couch, a well stocked kitchenette and bathroom with shower, toilet, sink. An upper back deck offers privacy, patio table and chairs and small charcoal bbq. Enjoy the panoramic views of Kachemak Bay and the Kenai Mountains. Overnight rate is $105 for two, tax included. An additional $15 will be required for any individual over 12 years of age. Small pets are allowed with prior approval.